First of all, people need to understand the concept of spiritual maturity in the right manner. According to the definition of spiritual maturity, it can be explained as the phenomenon in which all human beings are developed naturally in order to live prosperous and have healthy lives. 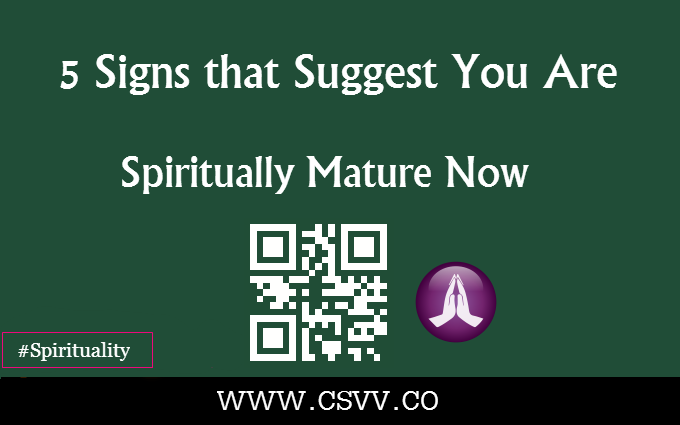 In a broader context, it can be assumed that spiritual maturity has lot to do with other factors such as environment and family background because these two factors also influence the extent of spiritual maturity a great deal. When you are able enough to follow certain rules and regulations in order to attain some purpose or objective of your life, then you can easily assume that you are spiritually mature now. This is because of the reason that spiritually mature people actually implement some special guidelines such as love, empathy, forgiveness, selfless living and so on. At the same time, these kinds of people try to overcome their negative emotions and gestures for the sake of developing their personalities in the right and acceptable direction. During these moments of your life when you observe that you’ve started caring for others, then you should also assume that you have become spiritually mature. At the same time, you take pride in helping others and you do not hesitate to raise your voice for others as well. Therefore, as a result, your personality becomes more appealing and attractive because you have certainly developed pleasant attributes in your personality. Those people are also regarded as spiritually mature who actually follow self-reflection in a true manner. This is important to note that people actually evaluate their sayings and actions because they assume themselves responsible for all of their actions. In this way, there is the likelihood that you will not blame others for your failures anymore and that indicates you are on the right track of becoming more spiritually mature. This is another sign that shows people are becoming more spiritually mature if they are applauded and appreciated by others. Therefore, in different kinds of demanding and pressure situations, you do not lose a moment of happiness at all. In this way, you are able to make others happy and satisfied in a great way. This aspect should be taken into consideration that sometimes we do not celebrate a joyful moment in our lives and as a result we are unable to take positive results and inspirations. Therefore, it can be assumed that spiritually mature people do not remain happy always but at the same time, they are also regarded as more cheerful persons. This is one of the most crucial signs through which spiritually mature people can be easily recognized. These people actually forgive those people who hurt them because they do not want to make their lives disturbing and poisonous. In addition, they tend to recover quickly from bad experiences and always try to learn something positive all the time. As a result, they are able to attain positive vibes and emotions from the inside of their personalities. Spiritual maturity comes with age as people should also realize this aspect, that this is a kind of attitude that can surely develop their lives in the right direction. Therefore, it takes a lot of hard work and courage in order to become an effective spiritual person in reality. With the help of these above mentioned signs, people can produce desired impacts and outcomes in their lives to a large extent. Jennifer Lawrence is a professional psychologist by profession and at times, she likes to write about spirituality and its impacts on the lives of others. Apart from professional commitment, she is planning to start her new blog in the name of The Essay Help UK on various social media platforms.